In the Library basement, the narrator knocks on a door, “It was a normal, everyday knock, yet it sounded like someone had whacked the gates of hell with a baseball bat”. I wonder how many of us fervent readers can relate to that imagery of the depths of library deep in the stacks, down in the dungeons, alone, first time in that part of the library, in the dark and silence, facing our fears? So the unnamed young narrator finds himself in a Kafkaesque underground world, jailed in a cell within a labyrinthine maze of corridors below basement, his food served by a beautiful, dumb, girl who speaks with her hands and floats in and out of his cell, and his sheep-man jailor, both of whom serve the custodian, an old man, in charge who has confined the youngster there until he has memorised all 3 books about Taxes in the Ottoman Empire, the subject which brought him to the library in the first place. If he is unable to memorise all the books within one month, his brains will be sucked out and eaten by the old man. This is a mesmeric tale, almost like a fairy story but creepier with the usual off-the-wall Murakami surrealism – a typical Murakami exploration of loss. The youngster looses his new shoes, his pet starling and eventually his beloved mother to be left alone in the world, unsleeping at 2 o’clock in the morning and thinking again about the basement and its darkness. 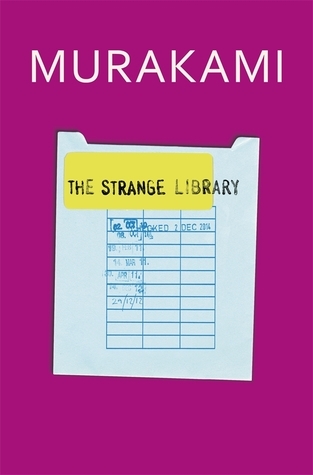 Physically the book’s cover has an old –fashioned library ticket pocket stuck to its cover. The short story/novella’s text is augmented with drawings and graphics, imaginary and such as one would expect to find in an old reference tome. There was an article in Independent about book design which mentions this book. ashramblings verdict 4* – probably one of the more accessible Murakami stories, and it is a short read. I can’t explain Murakami nor why there transcendence beyond reality works, but am a huge fan and I loved this one!